University of Washington (UW) is a multi-campus university with 16 colleges and schools as well as a world-class academic medical center. Before implementing Trumba, UW lacked a centralized event management system. Departments across the university used a variety of calendaring programs to promote their events. Lack of coordination resulted in conflicting and inaccurate event information and confusion on the part of the university’s constituencies. UW wanted an event management system that could be controlled centrally and yet give individual departments the ability to create and promote their own events. UW also wanted a system that would integrate seamlessly with the university’s Shibboleth identify management and authentication system. One of Trumba’s most powerful characteristics is the way it supports centralized control over styling, calendar creation, event templates, and custom fields while simultaneously allowing for calendar-level variations. It achieves this balance by supporting a flexible account type hierarchy and sharing permissions framework. This makes it easy for multiple people to keep calendars up to date and promote the same events on more than one calendar without worrying about conflicts or inconsistencies. The UW’s Trumba implementation includes over 500 calendars across three UW campus locations. "We particularly like the way Trumba makes it easy to share calendars and event information with a simple interface," said Gregory Koester, Technology Manager, UW Information Technology (IT). UW IT created a standard event template with custom fields that meet the needs of the majority of departments. This results in a consistent look and feel across all published calendars. Where necessary, departments can customize their calendars with styling variations and unique custom fields. 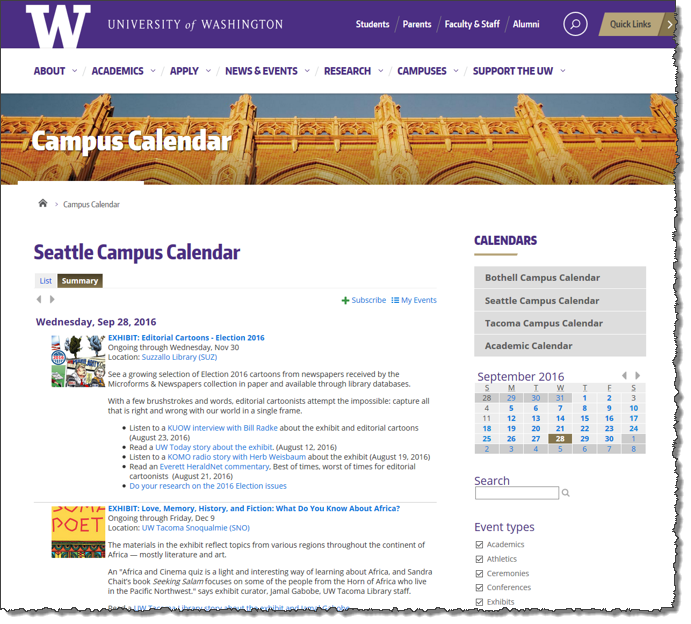 The UW Seattle, Bothell and Tacoma campuses each publish a main campus calendar. Campus calendar administrators share the main calendars with departmental editors who want to promote departmental events more widely. Administrators can tailor each editor’s permissions individually. They can also set up workflows that allow some editors to add events directly to the main calendars while other editors initially post events to an internal calendar where they must be approved before they go live. UW leveraged Trumba’s deep customization tools to fully integrate calendars into its website. Using Trumba’s control and promotion widgets, UW extended its customization to site visitors’ experiences as well. Visitors can switch calendar views, navigate to a specific date, search by keyword, and filter by one or more of 12 UW-defined event types. Trumba offers a Single Sign-On (SSO) feature based on the Security Assertion Markup Language (SAML 2.0) XML standard. Trumba, as a service provider, communicates with UW’s SAML 2.0 identity provider, which controls the information used to authenticate and authorize users. This interface with the UW Shibboleth installation means that UW staff can sign in to Trumba using their UW Net IDs, eliminating the need for calendar editors to use multiple login IDs and passwords. Trumba Corporation is a sponsored partner member of the InCommon® Federation. Trumba's SAML metadata is automatically propagated to the identity provider software of other InCommon participants.